No explanation needed, here's your Shot of the Day. 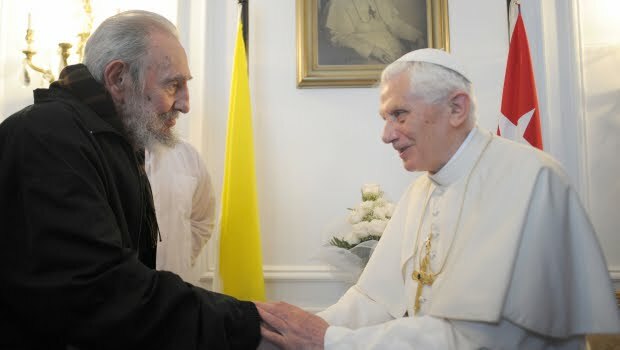 During their half-hour meeting at the Apostolic Nunciature in Havana, Fidel Castro reportedly urged B16 to canonize Blesseds John Paul II and Teresa of Calcutta, and apparently had some liturgical questions for the pontiff, according to the Vatican spokesman, Jesuit Fr Federico Lombardi. The Pope leaves Cuba at 5pm local time (6 Eastern) for the 10-hour return flight to Rome. "I Come to Cuba As a Pilgrim of Charity"
"God Wants Us To Be Happy Always"